Based on recent groundbreaking studies that will change the way parents feed their children, Allergy-Free Kids is a revolutionary guide to preventing food allergies. When her infant daughter was diagnosed with life-threatening food allergies, Robin Nixon Pompa found Dr. Gideon Lack, a clinical researcher on the verge of a breakthrough in allergy prevention and treatment that would heal her daughter and, later, her sons. The secret: building acceptance of allergens through repeated careful feedings. Instead of avoiding eggs, nuts, and other allergens, as previous recommendations held, most parents should introduce them into their children’s diets, "early, carefully and often, for at least the first five years of life." This life-changing approach is being embraced by the medical community, especially for peanut allergy, and is reflected in new guidelines from the American Academy of Allergy, Asthma and Immunology, the National Institutes of Health and other major medical associations. 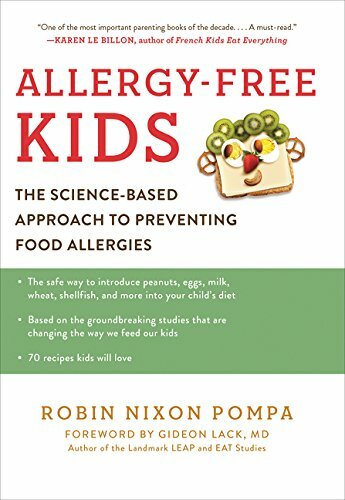 Allergy-Free Kids includes a concise, easy-to-understand overview of the research as well as seventy simple and delicious kid-friendly recipes to help parents integrate unfamiliar allergen foods into a child’s diet. Divided by allergen, Allergy-Free Kids contains sections on Eggs, Peanuts and Tree Nuts, Cow’s Milk, Sesame, Wheat and Fish. It also discusses other foods, such as kiwi and soy, which are increasingly causing allergic reactions. The book includes feeding advice, and maintenance doses, followed by recipes suitable for babies, toddlers and preschoolers, including Open Sesame Sweet Potatoes, Nut Flour Crackers, Cocoa "Puffs" and Eggs-Pretending-to-be-Muffins. Following the new medical guidelines, Allergy-Free Kids empowers parents to help their kids avoid a lifelong struggle with food allergies—and bring variety and joy back to family meals.